Having worked in the live sound industry for almost a decade now, there have been many times where I’ve found myself working alongside someone twice my age. Math says that person should also have two to three times the experience as I do, which makes me realize there’s a tremendous amount that I don’t know. However, in my relatively short time I have seen trends, products and brands come and go, and as in any other facet of life there are few successful products and brands that stay around for the long term. Call it a special discernment or just common sense, it’s usually pretty obvious to me which manufacturers are just trying to one-up the competition, and which are taking a long-term, big-picture approach to development and are the real movers and shakers of the industry. Even though I’m only 10 years in, I can tell you without a doubt that Waves is one of the latter. Since around 2005, when live engineers were no longer confined to their console’s channel strip and were given the ability to use studio plugins in their shows, Waves’ market share has been on a remarkably steady incline. Judging by their prevalence in the industry today and the products they are developing and releasing specifically for live sound, there’s no question that Waves are here to stay. I must say that when Waves first released the eMotion LV1 software mixer I found it to be interesting, but not necessarily in either a good or a bad way. It was a live sound console, running on a Windows or Mac computer together with some I/O boxes. It was not immediately appealing to someone like me who was used to having it all inside one ‘box,’ with lots of pretty lights and buttons and XLR connections right there on the unit. But then I took the LV1 out on tour. The first time I got a full LV1 system, I had it all laid out on my desk and fairly quickly came to an earth-shattering conclusion: Component-wise, this is absolutely no different than any other digital live sound console on the market. Piece by piece I went through it… ‘OK, so the PC here is running a mixer application, which in turn controls a DSP that speaks to audio I/O hardware, which brings the audio physically in and out of the system.’ The only difference is that it’s not all cased up into one box with faders and buttons on it! I figured I could just make my own case for all of this and rack it all up. So I did! I now have the entire console with 12 mic pre’s, 6 analog outputs and a network switch all connected and mounted into one 3U Hardigg shock rack, with the whole case light enough that I can check it onto an airplane. Having had some prior non-touring experience with the LV1, I came to realize that it was optimized to operate using a touch screen. 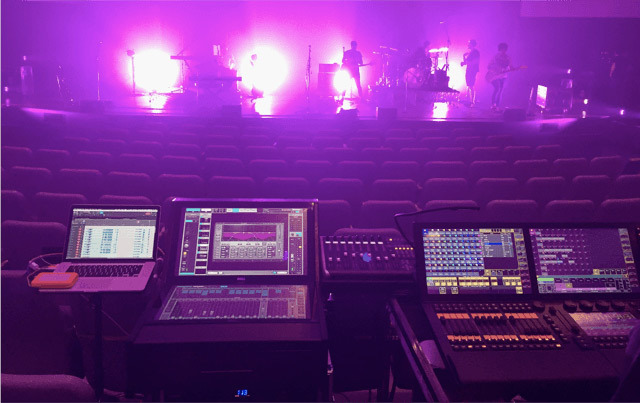 With the console application running on any PC or Mac you could keyboard-and-mouse it all day long; however, this was not going to work well when you’re in the heat of a live production and need to quickly move around the console. 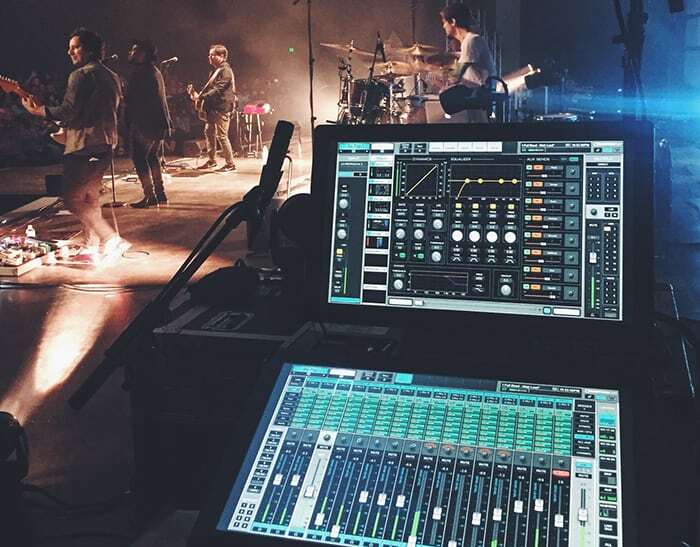 Waves’ developers made sure that all operations and workflow of the console, including the use of touch screen faders, would work to the point that doing an entire gig would be easily possible using only one touch screen. For instance, you can touch and adjust up to 10 faders at once, and as long as you don’t lift your fingers from the screen surface you can run all over the mutes, panning, plugins and routing assignments, and it will still only be controlling the faders that were initially touched, until contact with the screen is broken. The first time I used the touch screen faders with the LV1 I thought to myself, ‘Wow, this works way better than I imagined.’ Then, when I used the touch screen faders on a computer running an i7 and SSD, I could not believe how smooth and fluid everything was! I never thought I’d say this, but mixing on glass was effortless and beautiful. 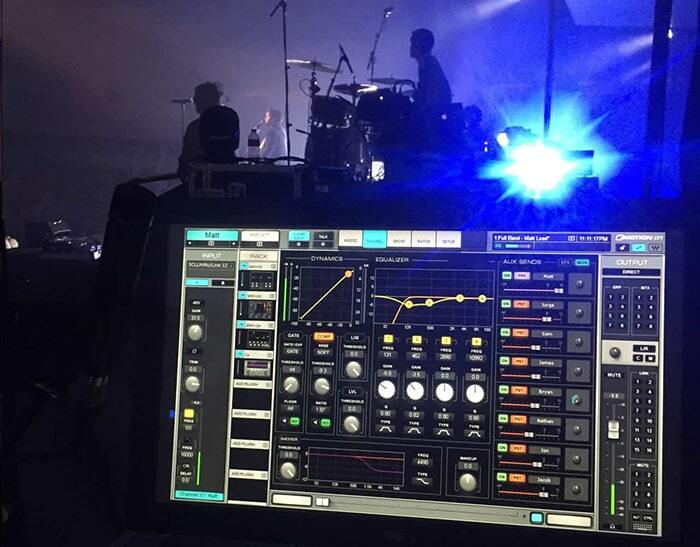 When I decided to take the LV1 out for FOH on a tour with Matt Redman and give it a proper go, our monitor engineer Josef Mirakovits agreed to take one out as well. One of the many great things about the Waves LV1 is that the software is cross-platform, so building a file on a Mac and loading it onto a PC or vice versa is no problem. Both of us built our show files for the run on our Macs, and since no hardware is needed to run the software, I was getting a lot of this done on the plane heading out for tour prep. We eventually loaded the files into the Windows-based LV1 consoles we were using and fired everything up. Knowing what the band like to hear, Josef had already pre-mixed his entire file and I had loaded all of my plugin presets for the Redman guys that I had made in Waves MultiRack on other console platforms. We were both well over halfway there before hearing any audio, which naturally gave us a great starting point. Each one of our LV1 consoles consisted of two 23” touch screens, an i7 PC running Windows 10, a SoundGrid Extreme Server and a network switch used for adding other SoundGrid devices. At FOH I also had a redundant SoundGrid server which would immediately take over if anything were to happen to the primary server. Both FOH and monitors had a 12x6 local I/O plus a 48x24 stage rack which we shared using a MADI split. Josef had preamp control at monitors and I was getting a direct patch from the stage rack and using digital trim to offset anything that was required on my end. As far as our console system goes, loading in each day consisted of taking the lids off the racks, plugging in power, and plugging in six network cables (with better planning this could have easily been reduced to only two cables!) including running the long 300’ cable from stage to FOH. Our audio console setup would take no more than 10 minutes, and since we didn’t have big heavy desks to tip we could easily set up our systems by ourselves which was way more convenient than I even thought it would be. For all of our audio I/O we were using the DiGiGrid IOX units which each have 12 mic pre’s and 6 line outs in a single rack space unit. Having Waves floating point processing through the entire audio system equated to a very pure sound with an absolutely enormous amount of headroom. Stephen Bailey’s LV1 setup at FOH: (1-2) Dual-screen computer running the LV1 console; (3-4) two Waves SoundGrid Extreme servers (one for redundancy); (5) network switch; (6) DiGiGrid IOX audio interface. The console application itself is very straightforward and user-friendly, and also exceptionally powerful. You’ve probably heard or read that before about many different products, but I’m saying it like it is. You can route any audio from any input source whether hardware or digital to anywhere in the console, anywhere on the network, or any port of any output device with many different options of doing so: with plugin processing, without plugin processing, pre-fade, post-fade and even post-pan. The LV1 console comes with a more-than-standard channel strip giving you filters, EQ, compression, expansion/gating, leveling, de-essing and limiting on every channel; but this being designed by Waves, naturally the entire console is built around plugins. Every path on the console gives you 8 slots to add any SoundGrid-compatible plugins that you want. 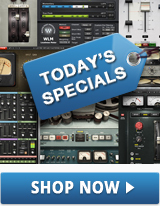 If you want to use the Waves SSL E or G-Channel strip on your drums and the Waves API models on your guitars – easy. Change your mind and want to reverse them? No problem. You can drag and drop the plugins to change the processing order and even move plugins across the screen from channel to channel. Also, since eMotion LV1 is SoundGrid-based, I was able to run some SoundGrid-compatible Flux and Plugin Alliance tools alongside my Waves processing. With SoundGrid being the backbone of LV1 systems, there are a few major advantages. First is that the system latency roundtrip with most plugin processing is only 800 microseconds! At monitors and with IEMs this translates to a very close and realistic sound, particularly for vocals and drummers. At FOH, this translates to a very immediate sound. Out front, this immediacy can be very ‘in your face’ and aggressive, or mixed more subdued to make a performance feel intimate and personal because it seems so close. It’s hard to quantify this sonic characteristic of LV1 – hearing is believing. 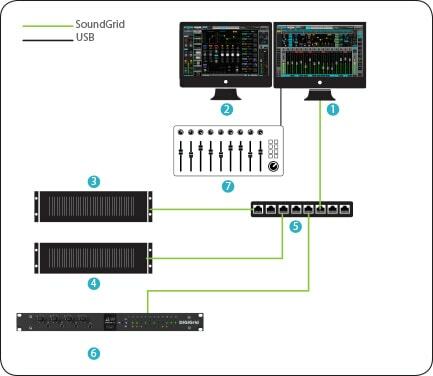 Also, with SoundGrid, we are able to add any computer as an audio device and send up to 128 channels of 96k audio back and forth from it, simply by connecting it somewhere to the network with a single network cable. 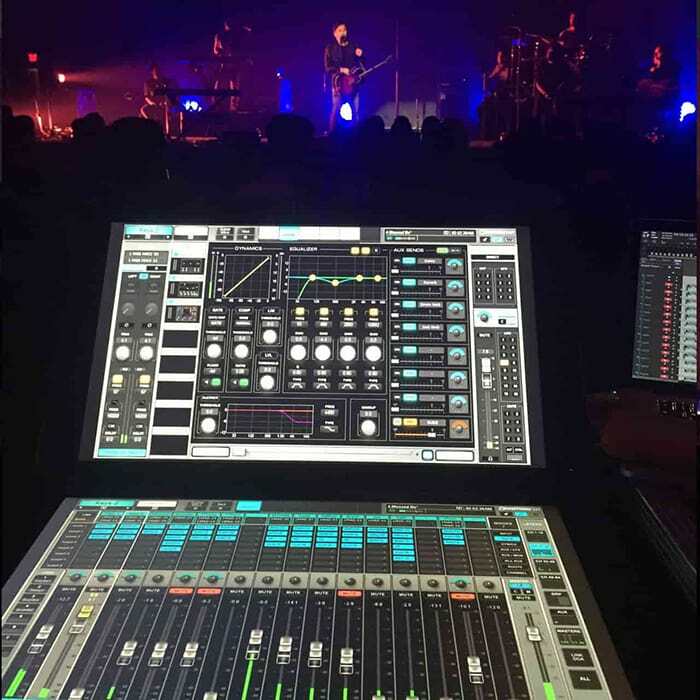 I was using a computer at FOH for walk-in music from iTunes, for multitrack recording of the whole show, and also for running playback for virtual soundcheck – all using the one connection. The same goes for stage computers running Ableton and MainStage… no more DI boxes, audio interfaces, unnecessary DA > AD conversions and latency. Now it’s 128 channels of audio per computer through one network cable. The days of faffing around with noisy DI boxes, bad patch snakes and drivers for random audio interfaces are over! So the tour went off without any issues, the gear was extremely solid and we were all very happy in the end. We had a great sounding PA with us on that run and I was really able to tell just how good the LV1 sounded. It was huge. Maybe it was the plugins, maybe it was the internal architecture of the mixer and the summing, or maybe it was all factors combined! I don’t really care but I’m happy to look anyone in the eye and tell them that this was sonically the best sound I’ve ever heard coming out of a sound console. This also made mixing fun to me. With everything in the LV1 console being time-aligned down to the sample, you don’t have to worry about anything… all you have to do is mix and make it sound good! When I factor in the untouchable sonics with the price point, the flexibility and the portability of the system, it would now seem illogical for me to take anything else out on tour.